If you’ve been following my Facebook page you know I’ve been doing some live feed video. It’s a great opportunity to connect with readers and show YOU how easy it is to make good homemade food! Well each time I do a live feed I learn something new. The first time I made some soup online and when I streamed that video, I made mention of my dogs and how I locked up my herd – because I don’t want them barking in the background. The one thing I didn’t feel was necessary….is to lock out the cat. 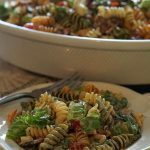 BLT Pasta Salad – a family favorite! So back to this amazing BLT Pasta Salad! It’s a family favorite – I’ve made it for YEARS! The first time I had this salad I worked at Natural Ovens Bakery in Manitowoc, WI. 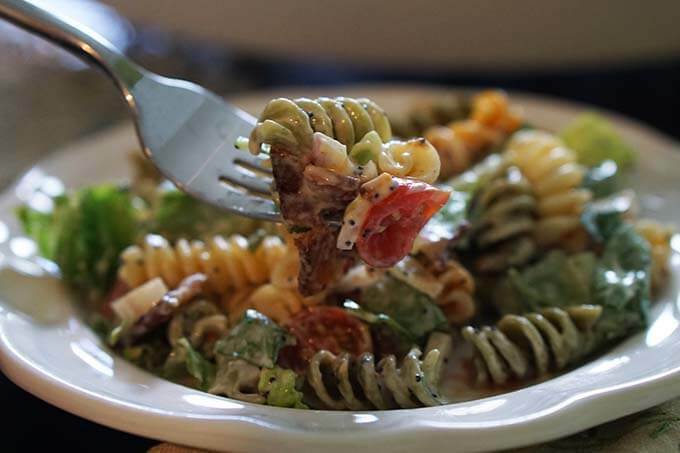 At Natural Ovens the owners would serve homemade meals to their staff, in fact you couldn’t even bring a lunch to work – they took care of everything – and one of the salads Darlene (our Chef) served was BLT Pasta Salad. I loved it so much, I worked on it until I got it just right and that’s what I’m serving up to you today! Start by cooking the pasta to al dente’ (I recommend cooking it the night before), drain really well – drizzle with some olive oil & seasoning salt. 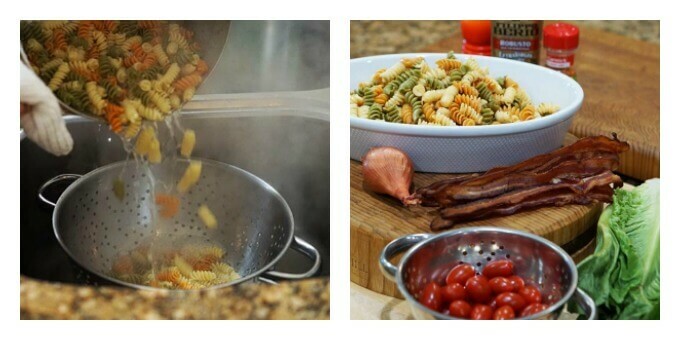 Allow to cool completely* and refrigerate the pasta – next you’ll gather the ingredients. As you can see, it doesn’t take much – bacon, lettuce, tomato, shallots – I also recommend a homemade poppy seed salad dressing, but if you use store bought…I won’t tell! 😀 Coleslaw or poppyseed dressings are both delicious! Cook the bacon, drain & crumble, chop the tomatoes, lettuce and shallots. Add everything to the pasta including the dressing and mix together well – easy light lunch! Pair with a grilled meat for a simple dinner. 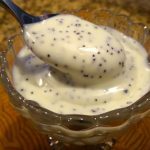 Everyone loves this salad and it’s great to take to a potluck too – with the poppyseed salad dressing it’s creamy and tangy, the salad is salty and crunchy – so savory and delicious! I know you’re going to love this one! 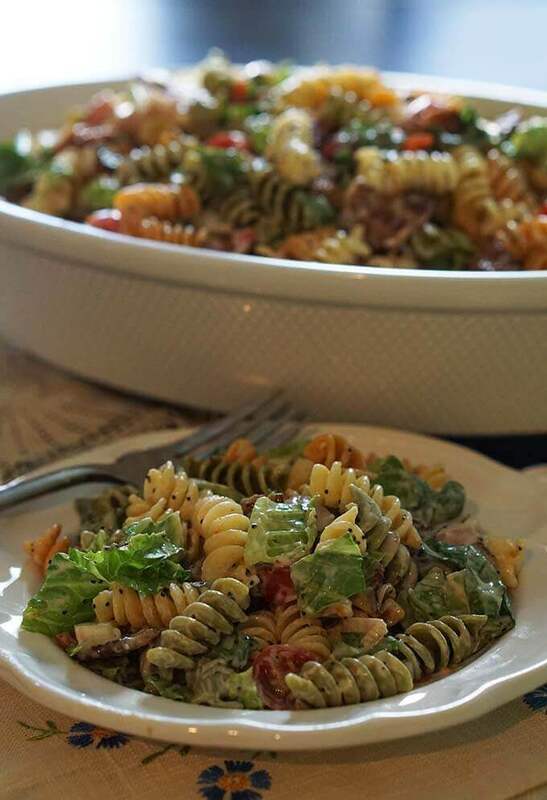 What’s your favorite summer pasta salad? 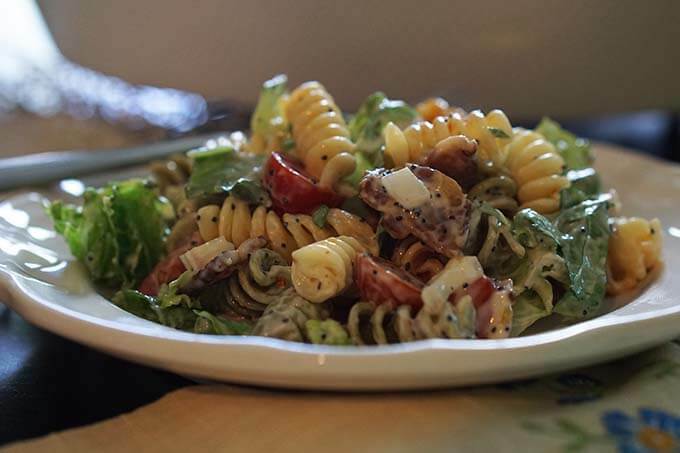 BLT Pasta Salad Recipe - Love a great BLT? Then you'll love this salad. Everything from your favorite sandwich combines to make your favorite pasta salad. Cook pasta according to package directions (aldente). Drain well. Transfer pasta to a large bowl and sprinkle with one teaspoon olive oil and one teaspoon seasoning salt and mix well - refrigerate until completely chilled. Cook bacon until crispy. Drain well and crumble. Add to the pasta. Chop tomatoes, shallot, and romaine lettuce. Add to the pasta and toss well to combine. Add about one cup of poppyseed salad dressing and mix well. Refrigerate until well chilled. Before serving mix again. Super easy - better than store bought too! Combine all of the ingredients in a screw top jar and shake well. Refrigerate for an hour before using. Leftovers will keep for 3-4 days in the refrigerator. 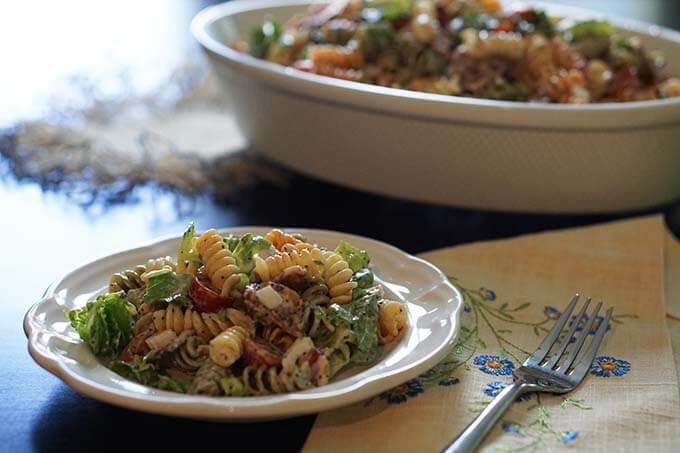 * When you’re making pasta salad, you’ll want the pasta completely chilled before adding dressing – if the pasta is hot, it will absorb the dressing and get mushy! So it’s best to make the pasta ahead and pop it in the refrigerator so it is completely chilled prior to mixing the salad. I love this salad but I guess my favorite is Potato Saled. Gotta love a great Potato Salad Lois! This sounds amazing! Just perfect for a potluck on the 4Th 🙂 Thanks for sharing! Yes, that would be perfect – this salad is such a crowd pleaser! Thanks for sharing this recipe on Let’s Get Real Link Up. You are so welcome!! Always enjoy your party!! Bacon makes everything better! Sign me up for a big bowl of this! I agree wholeheartedly! Thanks Sabrina! I could eat a mountain of this pasta salad. It’s gorgeous. You know….I think we have haha! Enjoy Kim! Thanks Chrisy! Just love this salad – I hope you do too!